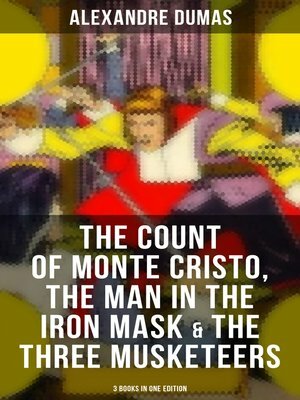 The Count of Monte Cristo The Three Musketeers The Man in the Iron Mask The Count of Monte Cristo is an adventure novel by Alexandre Dumas, first published in serial form from August 1844 until January 1846. The story takes place in France, Italy, islands in the Mediterranean, and in the Levant during the historical events of 1815–1838. It begins from just before the Hundred Days period and spans through to the reign of Louis-Philippe of France. The historical setting is a fundamental element of the book. It focuses on a man who is wrongfully imprisoned, escapes from jail, acquires a fortune and sets about getting revenge on those responsible for his imprisonment. However, his plans have devastating consequences for the innocent as well as the guilty. The Three Musketeers is a novel by Alexandre Dumas, first published in serial form in 1844. Set in the 17th century, it recounts the adventures of a young man named d'Artagnan after he leaves home to travel to Paris, to join the Musketeers of the Guard. D'Artagnan is not one of the musketeers of the title; those are his friends Athos, Porthos and Aramis, inseparable friends who live by the motto "all for one, one for all", a motto which is first put forth by d'Artagnan. The Man in the Iron Mask climactically concludes the epic adventures of the three Musketeers. Alexandre Dumas (1802-1870) was a French writer whose works have been translated into nearly 100 languages and he is one of the most widely read French authors. His most famous works are The Count of Monte Cristo and The Three Musketeers.